As soon as I saw the way Anthropologie was packaging their earrings and necklaces with old photos, I knew exactly how I was going to package the jewellery that I was planning to make with the new resin flowers. Above you can see two styles of rings and a matching pair of earrings that I created with the resin flowers. The design for the earring card holder was created using old family photos and a page from an old dictionary that I scanned and played with in Photoshop. I printed the art on photo paper and mounted it onto chipboard. Here's another pair of earrings and a matching necklace that I created using the resin flowers. The woman on these jewellery card holders is my Grandmother when she was younger. Not sure, but I think that these were taken when she was on her honeymoon. My Grandmother would have loved these!!! The pictures on these jewellery cards are of my father and I. The picture was taken in 1962 and it is one of my favourite pictures of the two of us together when I was small. I punched two holes in the card for the necklace so that I could add the ribbon and attach the necklace. I didn't make jewellery cards for the rings ... I've always liked seeing rings displayed in shallow containers filled with rice. So that is what I did with mine. 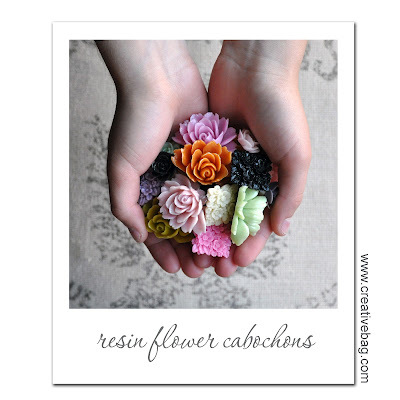 I just love resin flower cabochons right now. I've been using them on stationery and favor boxes for weddings and parties. You can see more of my ideas using these on Creative Bag's blog. I will be posting a tutorial for making some of these jewellery pieces on the Creative Bag blog next week if you are interested. 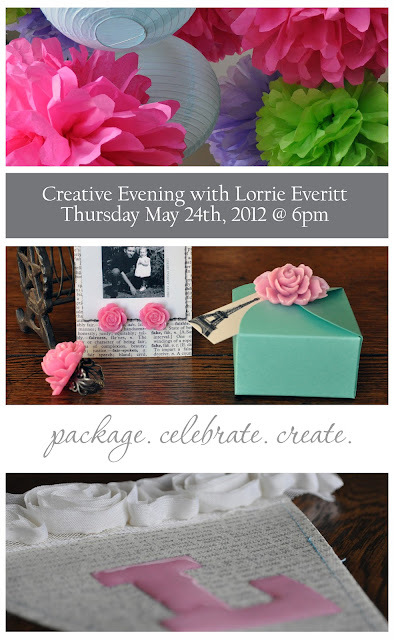 I will also be doing a demo with the resin flowers as well as a few other projects at Creative Bag's Toronto store on May 24, 2012 at 6pm if you are interested in attending. There is no cost to register but space is limited. Everyone will be making a resin flower ring and tissue paper flower pom-pom (yes, for free!) and you can find out more about the event and how to register here. To all of my Canadian friends and family, have a great holiday weekend!